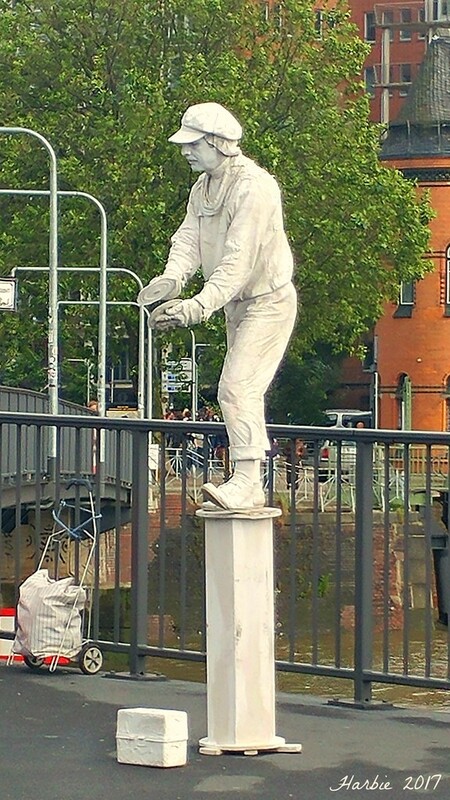 We were walking along the harbor in Hamburg, and my husband asked me if this was a statue. I looked at him like he was crazy (of course it was a statue)...but then I looked closer. It was a real person! I guess my husband isn't so crazy after all (he's more observant than me)! Best on black. Was it a kind of performance art? Certainly very intriguing! @janeandcharlie. It was! It was very hard to tell if it was a real person or statue! I would've walked right by thinking he was a statue. Living statues! You can see them here in several places, doing performances for tourists etc. Very cool! I probably wouldn't have noticed it was a real person.